Animal locomotion is an intricate interplay between neural processes and biomechanics. These components have co-evolved to form "neuromechanical" control systems in which neural commands organize actions and the structures and materials of the body translate these commands into movements. In some cases structures are able to accomplish movements with relatively little or no command input, but most behaviors in natural environments require intricate neural patterning. In animals that have stiff skeletons (such as vertebrates and adult stage arthropods), these motor programs rely on the constraints imposed by joints to reduce the degrees of freedom and simplify control. In contrast to animals with skeletons, soft animals do not have the same limits on movements; they can deform in complex ways and have virtually unlimited degrees of freedom. One of our major research goals is to identify how soft animals control their movements in a computationally efficient manner using the principles of embodiment and morphological computation. The control mechanisms needed to move soft animals and robots are largely unknown. Studying the forces, movements and neural commands in soft animals can help to identify effective control strategies. 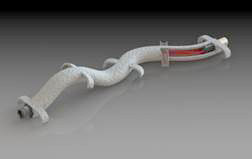 Computational simulation techniques can also be used to "evolve" control systems for soft 3-dimensional structures. These experimental and simulation approaches are expected to offer new computational paradigms for engineering structures and controls for soft robots. 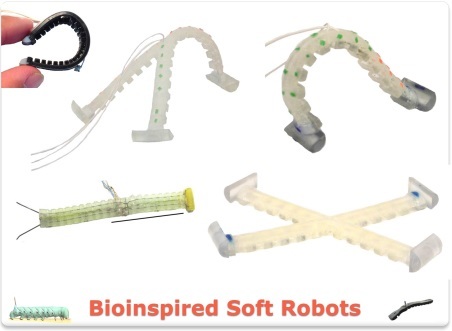 Based on extensive neuromechanical studies of soft bodied locomotion in animals, we have developed a family of actuated modules that are being used as development platforms for soft robots. These robots are about 10-15 cm long and weigh between 4g and 30g. Earlier designs were fabricated by vacuum casting silicone elastomers into 3D-printed molds, our current methods include printing the devices in a soft rubbery polymer using a multi-material 3D printer. These devices are actuated with shape-memory alloy (SMA) microcoils that can be controlled with current pulses. 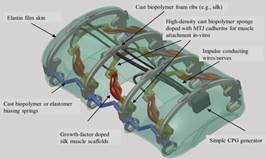 We have also constructed similar robots with back-drivable Maxon motors coupled to the body using flexible “tendons”. 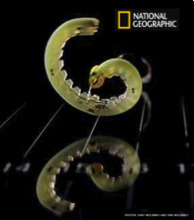 The body shapes can be changed to any desired form, but most of our current prototypes resemble caterpillars or worms. They can crawl, inch or roll and even climb steep inclines. One of our long-term goals is to "grow" robotic devices using a combination of biosynthetic materials, cellular modulation, and tissue engineering. In collaboration with Professors Kaplan and Levin we are exploring both invertebrate and vertebrate cell culture and regeneration systems to structure muscles and supporting tissues on scaffolds of biomaterials. These scaffolds could be degradable or allowed to remain as part of an operational biorobot. Such biological devices will be controlled using the simulation tools developed for synthetic soft robots and will exploit recent advances in soft material electronics. For these cell-based systems, we are generating bundles of contractile skeletal muscle tissue using insect muscle cells. These constructs will be engineered to contract in a controlled, coordinated fashion for eventual use as motors in soft robots. Insect cells offer novel features, such as high force, low oxygen demand, and low sterility requirements that are particularly advantageous. The goal is to harness the intrinsic structure-building capability of cells. The approach is to make biopolymer scaffolds with signaling molecules that direct cells into the desired shapes and functions. 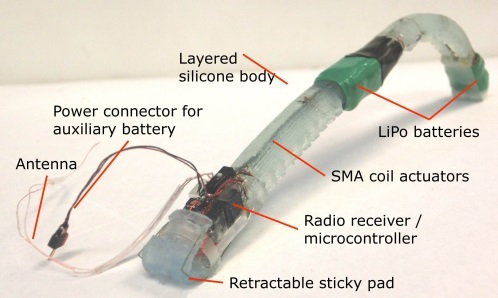 Hybrid devices grown on conducting substrates can be connected to implanted microchips for autonomous or remote teleoperation. These devices will be cheap, mostly biodegradable and biocompatible for use in medical and environmental applications.